When it comes to Ghostbusters, they've made a ton of great products over the years- the cereal, the cartoon, the amazing toy lines, and even the unbelievably delicious Hi-C Ecto Cooler juice- but this game isn't quite one of the great ones. 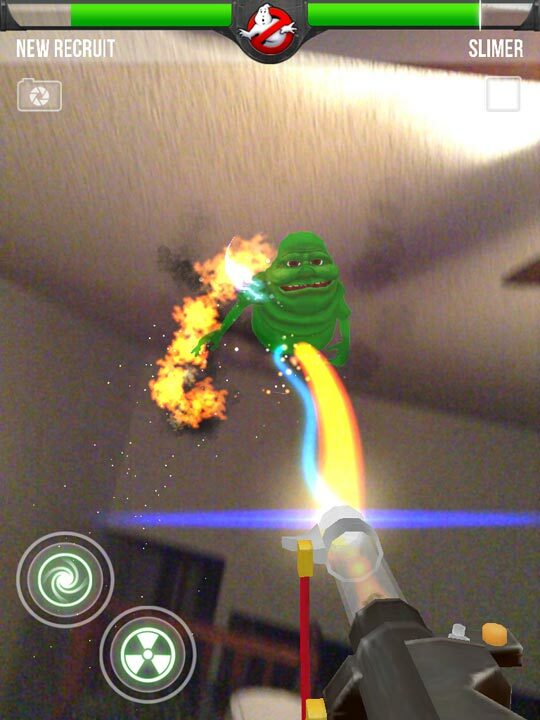 Players play as a recruit to the Ghostbusters, and which of the 6 you choose doesn't matter, because it's a first-person game. What the game does have going for it however is the ingenious way it uses the iOS device. Using your location it will send you to various local areas where you live via maps and GPS to capture ghosts, or as I shut off the locations, all of them were conveniently in my living room. 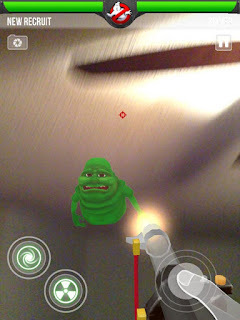 Then it uses the device's camera as a 3D viewer- meaning you'll need to swing the device around and hunt for the ghosts in the room you are in, sometimes needing to stand up and spin around hunting down the ghosts. The battles are short, consisting merely of draining a ghosts health bar by firing a stream out of the Neutrino Wand, and then tossing out a trap to catch it once its health is low enough. The monotony strikes quick as there are only 15 types of ghosts and each has attacks that are unblockable-but-weak offering a very limited range of things to look at and no real challenge. So the longer you play the more you need to level up your gear- through in game currency or IAPs- offering nothing new visually, just stat boosts for things you already have, meaning the leveling feels completely unnecessary towards real progression. 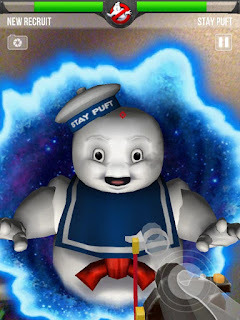 Although, a couple extra skill-items become available that make the higher level ghosts a bit easier, such as a stun blast, but they aren't ever necessary- even against the Stay Puft Marshmallow Man boss fights. As a life-long Ghostbusters fan Paranormal Blast offers about a half-hour to an hour of entertainment, but not a whole lot more. 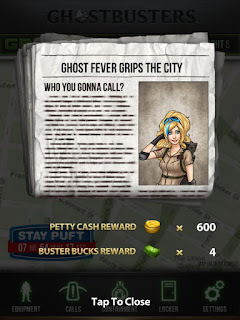 Paranormal Blast might have been something extremely entertaining with more development, because it does have some good ideas, it just stays in the boring shallow end of the gameplay pool and avoids wading anywhere near the deep end altogether. Outside of the game's novelty, its repetitive nature drags it into mediocrity. 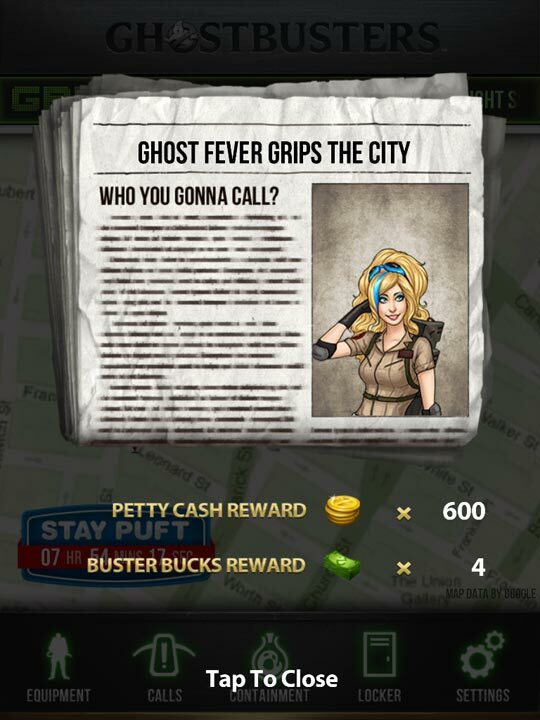 At best, Ghostbusters Paranormal Blast is just a quirky gimmick to waste a lunch break with.